What started as a bit of a crazy idea, very quickly became reality. That idea being, to take the ultimate Japanese import, the Nissan R35 GTR and rework it like never before. Many would loose their minds at the thought of taking the R35’s iconic VR38 V6 Twin Turbo and replacing it with a completely different engine and drivetrain. But for Baggsy it made perfect sense to transplant a Chevrolet LSX 454 V8 into the R35, and then some. 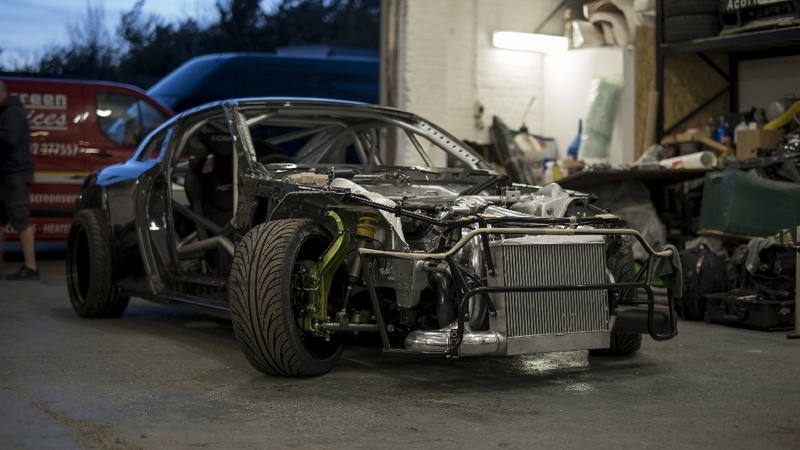 This was not just a simple task of getting a car ‘Drift’ ready, this was a complete ground up build, reworking every part of the original car from top to bottom. Oh and all this happened in just three months. Lets rewind to early February 2017 when the guys at SB Motorsport took delivery of the base car. 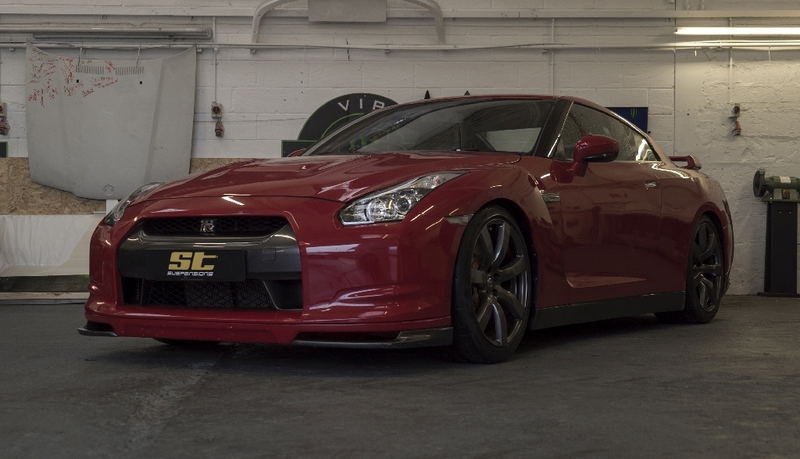 A completely road legal, non modified, non damaged, 17000 mile, 2009 Nissan R35 GTR. The car was driven off the transporter and into the workshop, yes that’s right, driven! The first task was a complete strip down to bare shell, with every component carefully removed, labeled and boxed. 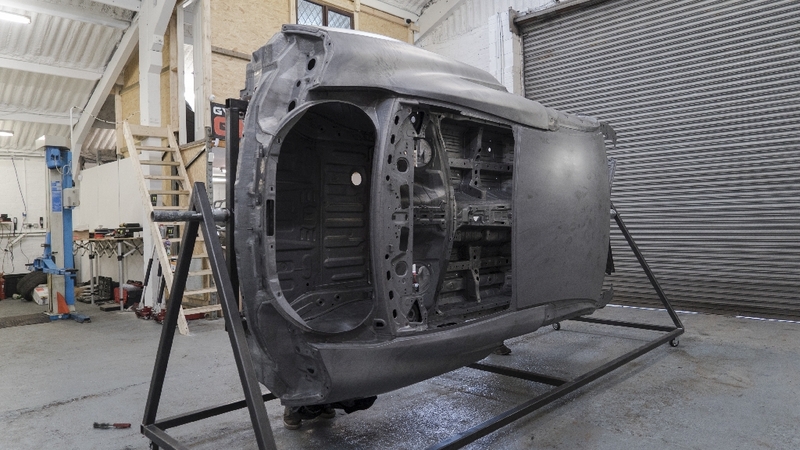 The bare shell was then taken to Nottingham to be acid dipped, stripping all of the paint and seam sealer, leaving a bare metal shell ready for work to commence. Back at SB Motorsport, the next step would be seam welding the whole shell inside and out and cutting out any metal not required. Pumping in as much strength whilst still trying to reduce weight would be a key factor in the whole build. With this completed, it was time for head fabricator at SB Motorsport, Ian Waddington to work his magic. 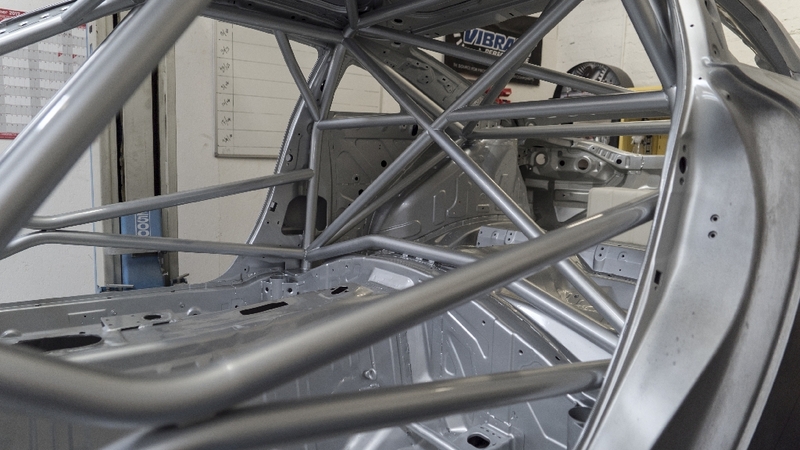 A fully custom fabricated T45 roll cage would be the new elaborate centre point of the interior. The cage would not only serve its main purpose of safety, but it would also inter grate with many components of the build housing such parts as the Nascar steering column, OBP pedal box and more. With the fabrication of the shell complete, it was full steam ahead to complete the build. With parts being delivered daily, it was down to head mechanic at SB Motorsport, Corbin Darke to piece together this very complex puzzle. 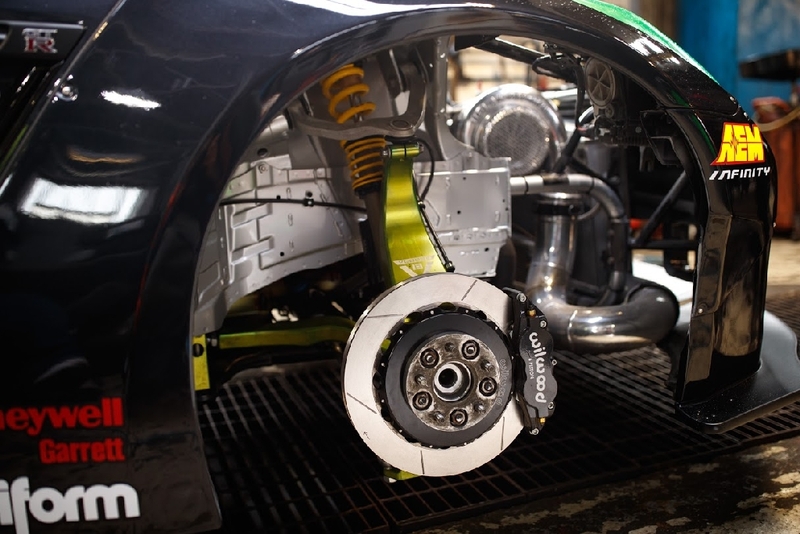 Corbin along with Ian replaced every part of the GTR from top to bottom whilst housing the brand new 7.4 LSX 454 V8 engine supplied by Parts World Performance. 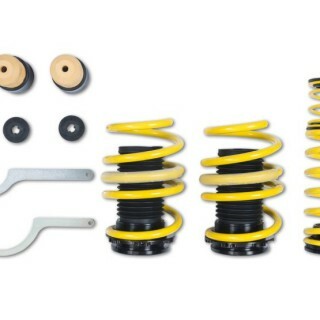 Their strategic plan of building the worlds first LSX R35 GTR was quickly unfolding. Ensuring the car was reliable, was a key factor. 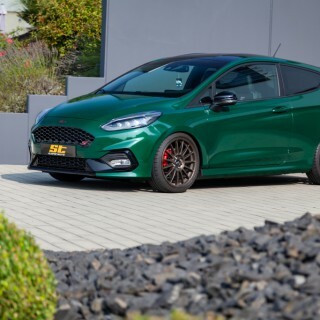 Everything from the 3 Way ST Competition Suspension, Forge Motorsport rear mounted radiator and front mount intercooler to the Asnu injectors and Vibrant fuel lines were spec’d and made to order specifically for the build. Keeping engine temps down, turbo spool time low and power figures high are all thanks to the meticulous planning from the guys at SB Motorsport along with Chris Jeanneret of Chris Jeanneret Racing. And of course none of this would be possible without the amazing help and support from the sponsors involved. With the main bulk of the build complete and the car freshly painted in a custom tinted black pearl, the team moved towards preparing the car to being started for the first time. Lacing a bespoke wiring loom into the R35 matched to the AEM Infinity ECU completed this stage of the build, and the car was soon firing on all 8 ready for the dyno. Chris Jeanneret and Mark Gillam of Abbey Motorsport put the monster LSX 454 V8 and GTX45718R combo through its paces. 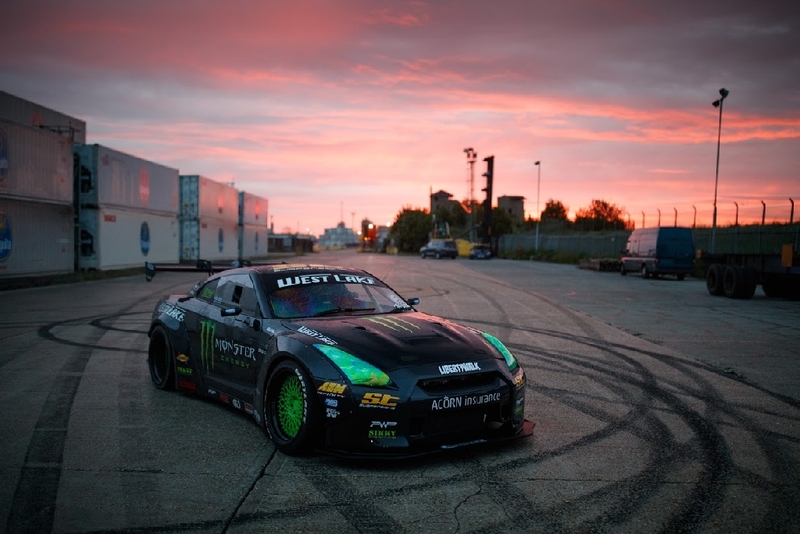 Fine tuning the car to 1200hp and 1150 ft-lb of torque, would see Baggsy behind the wheel of his most powerful drift car in his career. The GTR was loaded up and making its way back to SB Motorsport for the final leg of the build ready for its first appearance. The final steps of the build were underway. Ticking of the last parts of the long list and fitting the new Liberty Walk V1 body kit, Rotiform LHR wheels and livery meant the R35 was ready. It was time to load up and head for location to begin filming of Battle Drift 2. 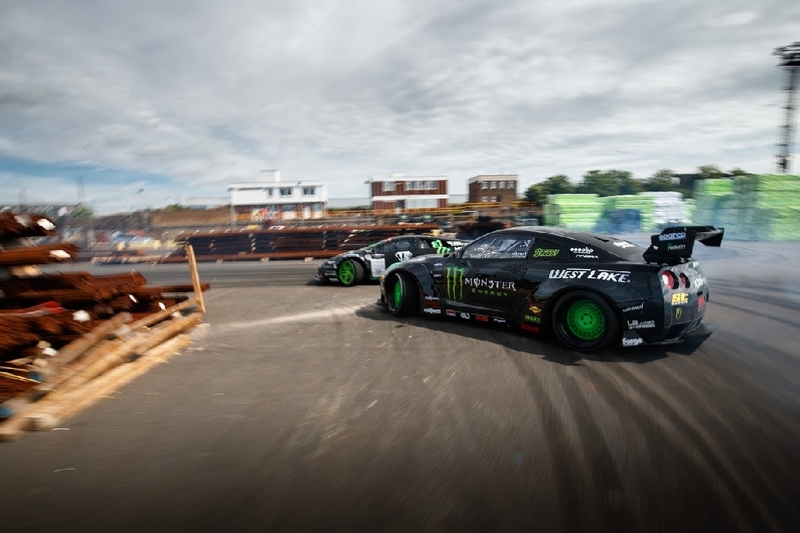 Baggsy would be going Head to Head with Daigo Saito in his world famous Lamborghini Murciélago drift car for the second installment of the Monster Energy franchise. Four days of filming on the docks of Sheerness was a spectacular way to finish off an intense 3 months of work. The completed project really does show that hard work does pay off. Baggsy: Where do I start. This has been the biggest and proudest moment of my motorsport career. Having the opportunity and support to build my new LSX swapped Nissan R35 GTR has been a dream come true. It still hasn’t kicked in what the team and myself have achieved in such a short period of time, and none of it would of been possible without the amazing support of all my sponsors. Being part of Battle Drift 2, and drifting with Daigo in his Lamborghini was amazing. 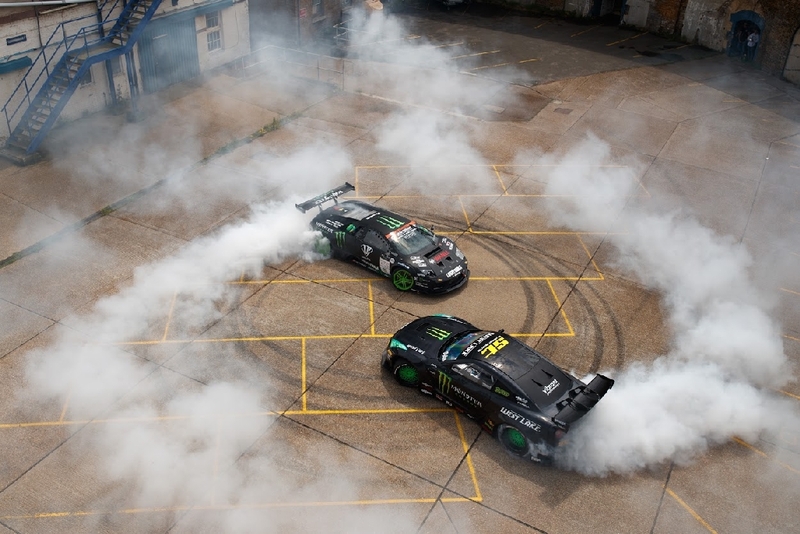 After the success of the first Battle Drift film, there was some big boots to fill. But having the R35 as my choice of weapon gave us the opportunity to go into filming full charge. 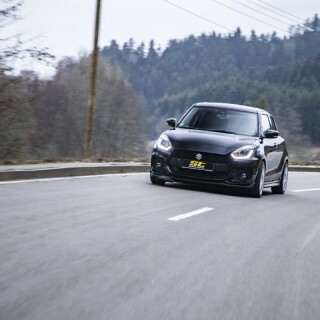 The four days of filming were great fun and the car worked straight out of the box. After watching the end product at the premier, all I can say is I am blown away by what everyone involved has produced. 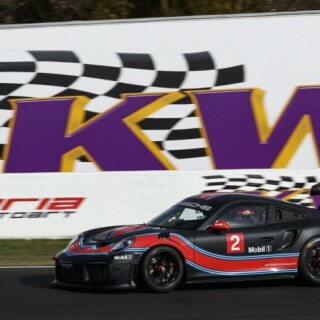 I couldn’t of asked for anything more from the film, car, my team and sponsors. Finally I would just like to thank everyone involved again. The build of the car, parts from sponsors and the Battle Drift 2 film, none of this would of been possible without you, and I hope you enjoy what we have created.